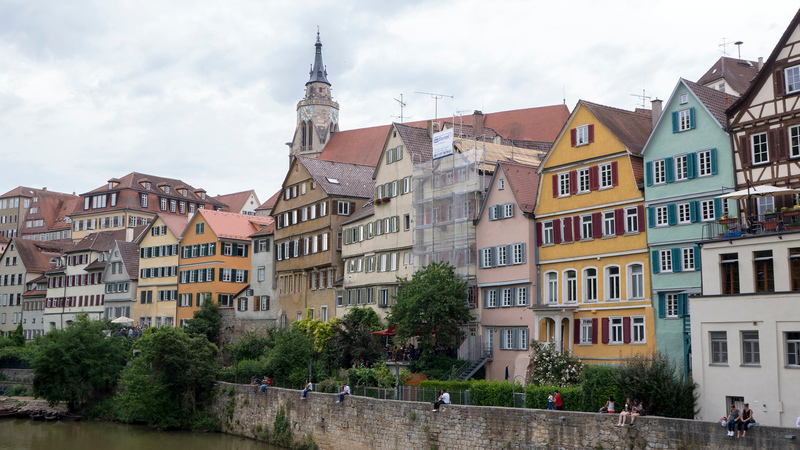 We immediately fell in love with the university town of Tübingen, Germany. Justin and I only had 24 hours to spend in Tübingen and we made the most of every moment. 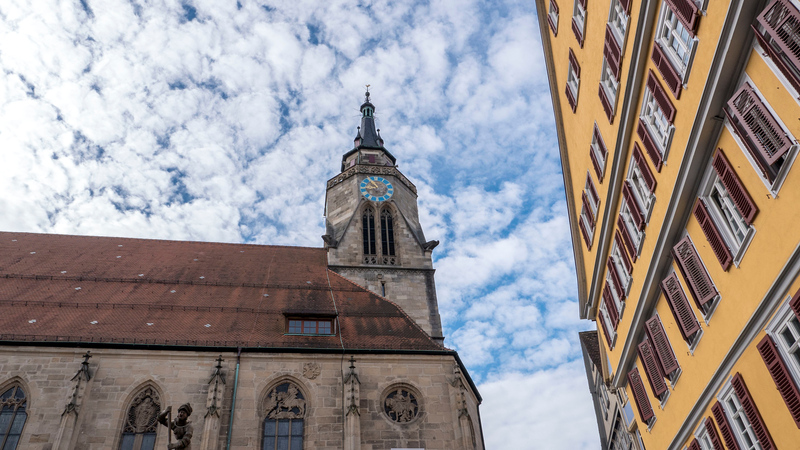 There are so many unique things to do in Tubingen, and you can see a lot in just a short amount of time. You can walk everywhere within its historic old town, exploring on foot. 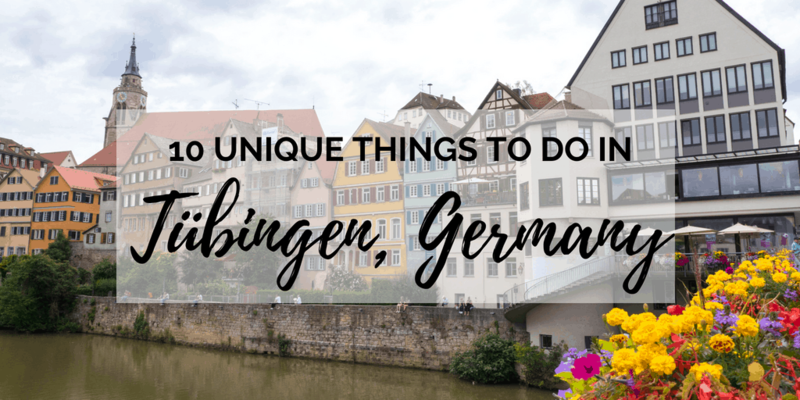 While this isn’t a guide for absolutely everything to do in Tubingen, we covered a lot of ground in one day. 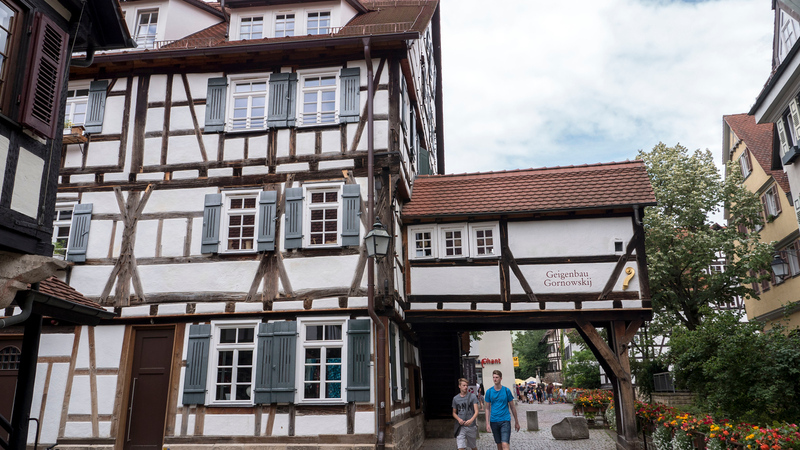 If you only have one day in Tubingen, this travel guide is for you. 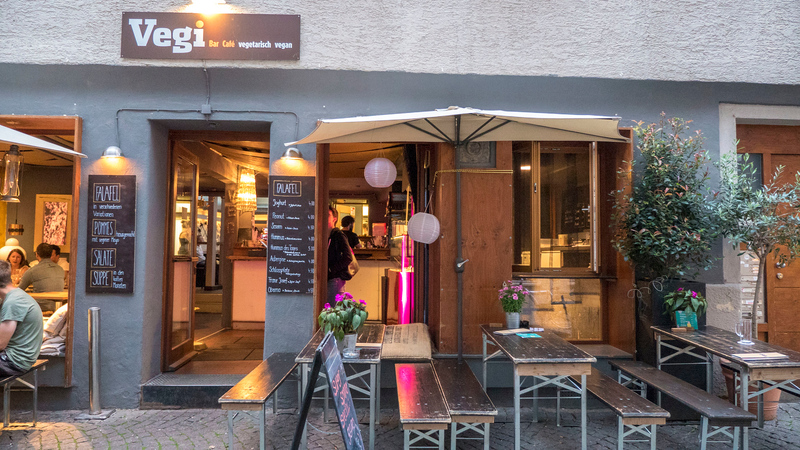 You might not have heard of Tübingen, but put this town on your travel radar. 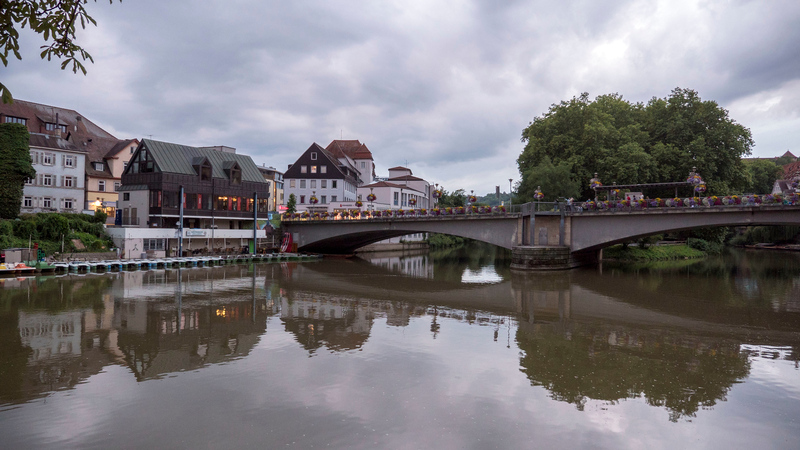 When I was researching our trip to Germany, Switzerland, and France, I wanted to visit a small town in western Germany, somewhere between Zurich and Frankfurt. Justin and I are finding more and more than we’re drawn to these smaller, captivating towns. Maybe it’s because I am from a small town myself. 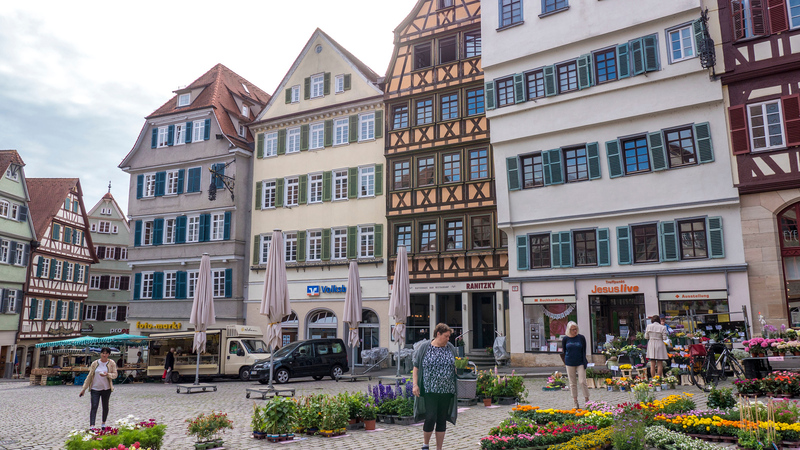 After some searching, I stumbled upon some photos of Tübingen and knew that we had to visit. About 30km south of Stuttgart, it was right on our route and I couldn’t resist the photos of its brightly painted, half-timbered houses. We have records of the town from as early as 1078, although Germanic tribes populated the area back in the 6th and 7th centuries. 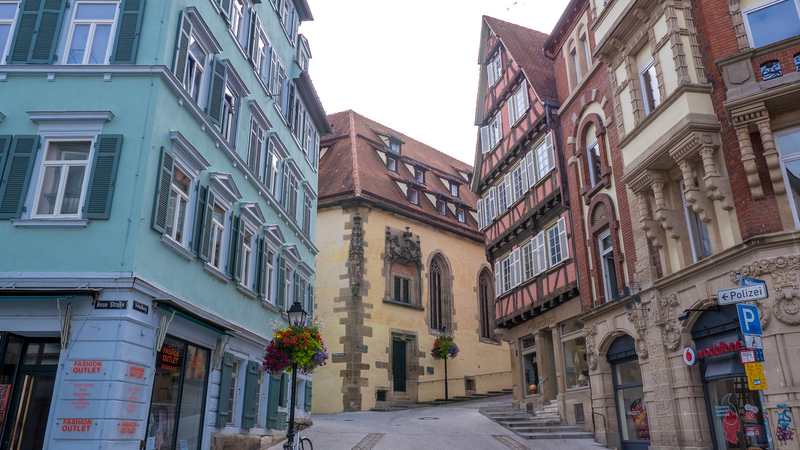 While wandering its photogenic, cobblestone streets, you’ll see that Tübingen is remarkably well preserved. During World War II, Tübingen was largely spared due to the lack of industry, high concentration of hospitals and the peace initiative of a local doctor. 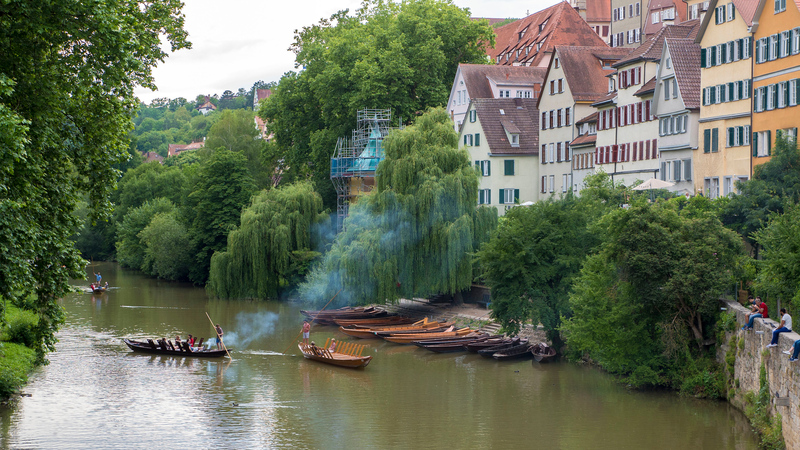 Tübingen is a traditional university town; about one in three people living there is a student. From its historical sites to its beautiful green spaces, there are so many unique things to do in Tubingen. Here are some of the activities we enjoyed in the town, and you’ll be able to easily do everything on this list within 24 hours of staying here. A great way to get acquainted with a brand new place is to take a guided walking tour with a local resident. We were grateful to take a walking tour all over Tübingen upon our arrival, from the base of old town right up to the castle grounds. Justin and I learned lots of interesting facts about Tübingen with details straight from a guide who has lived in the town all her life. After the walking tour, we continued to explore on our own in more depth. In mid-June, the town itself wasn’t incredibly busy and certainly wasn’t swarming with tourists. We really enjoyed the youthful vibes of the town, highly populated with university students. Wander at your own pace around every narrow alleyway, between the crooked half-timbered homes. You’ll notice old architecture and picturesque churches. 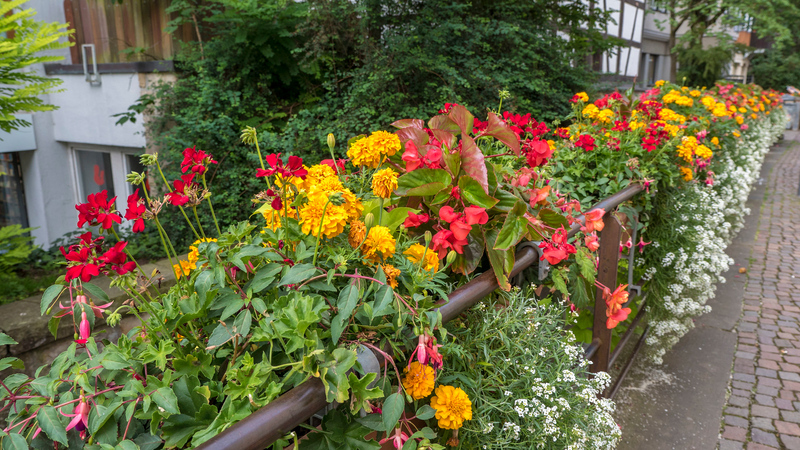 Bursts of bright, beautiful flowers lined the river and were flourishing from planters all over town. Everywhere you look appears as if from a postcard. 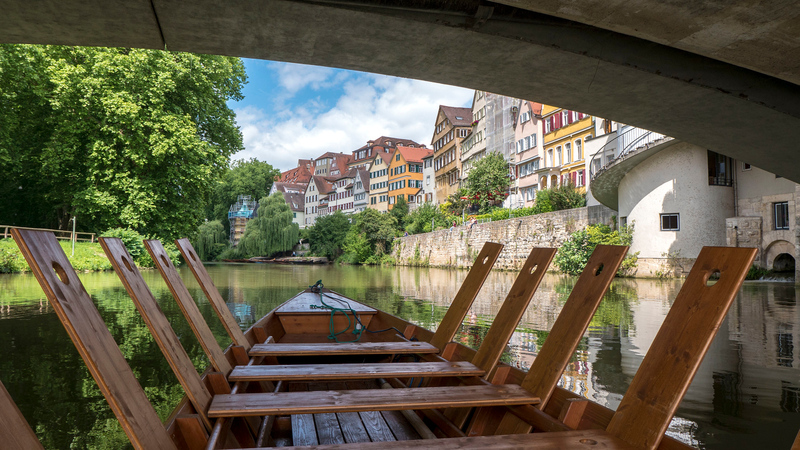 A punting trip is a bucket list activity that you simply must do when you’re in Tübingen. 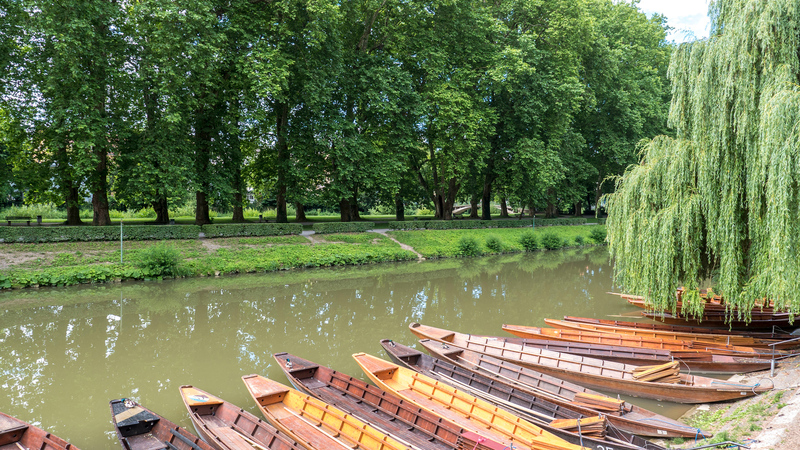 Punting (known as Stocherkahn) is a university tradition and most boats are owned by student fraternities. The boats are long and flat with bench seating in rows. 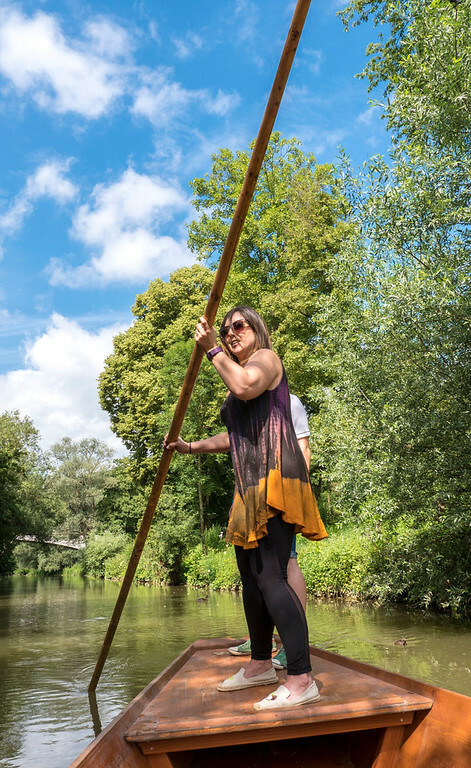 The punter propels the boat forward by pushing a pole against the bottom of the riverbed. Although we missed it this year, there’s an annual race every June between the students called the Stocherkahnrennen. Approximately 40 teams race in punts around the Neckar island in a lighthearted and fun event. As you can imagine, the river gets quite crowded with boats, especially in the narrower sections. The winning team throws a party, and the losing team members must drink a glass of cod liver oil, as well as organize the next year’s event. Both public and private punting trips are available. Justin and I embarked on a private punting trip on the morning before our departure. Our guide was amazing and very skilled in navigating our punt around the river. At one point, we even got to try it out for ourselves. It’s not as easy as it looks! The ride took about one hour, and it was incredibly scenic. We drifted past the green island in the middle and many colourful homes. Lots of ducks paddled right up to our boat, curious about our adventure on the water. I highly recommend you book a punting trip if you have the opportunity. There are even special events like wine tastings on the punt, and gourmet meals served on board. It’s very common to take a barbecue out on the river aboard the punts. 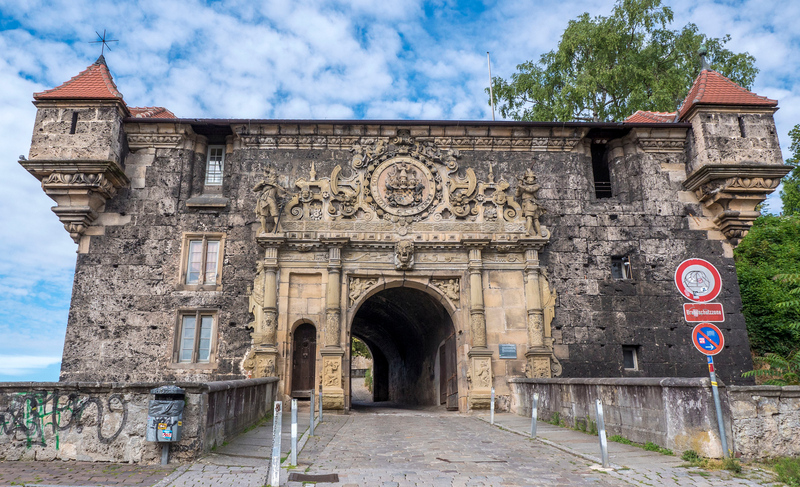 The Renaissance complex of Hohentübingen Castle is high on the hill, overlooking the old town. Walk up a steep, cobblestone road to reach the castle property. While the castle was built in 1037, it was extended in the 16th century, resulting in a mix of architectural styles. The castle is home to the university and some museums, including the Ancient Culture Museum. There are artifacts dating back 40,000 years, including some of the oldest artworks ever known to be produced by humans. Small figures carved out of mammoth tusks and bones were discovered inside caves in Germany, and they’re now recognized by UNESCO for their historical importance. You can see these on display at the Ancient Culture Museum. 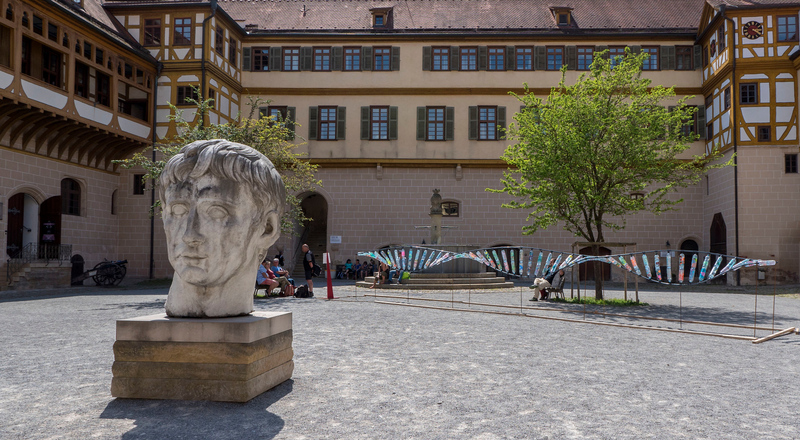 A large DNA sculpture in the castle’s square pays tribute to Friedrich Miescher who discovered DNA in 1869. 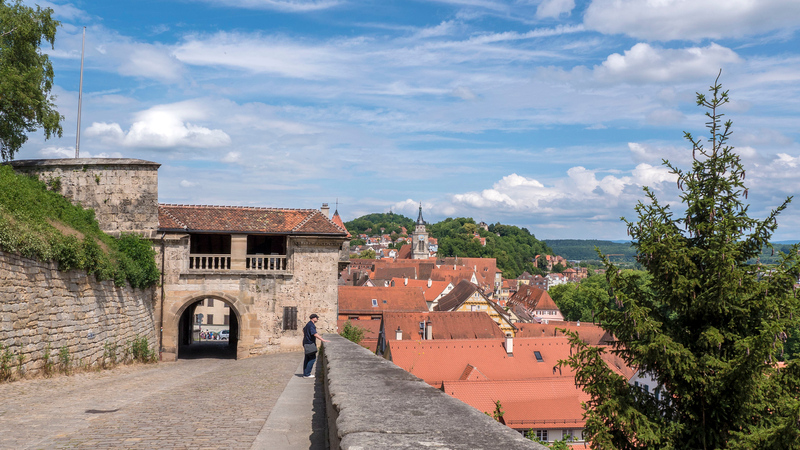 From Hohentübingen Castle, soak up some of the best panoramic views of Tübingen from the castle grounds. You can see all sides of the city, including the old town and the Neckar River. Wander around the property and gaze out above and beyond hundreds of red rooftops. The heart of Tübingen is the Marktplatz, or Market Square. 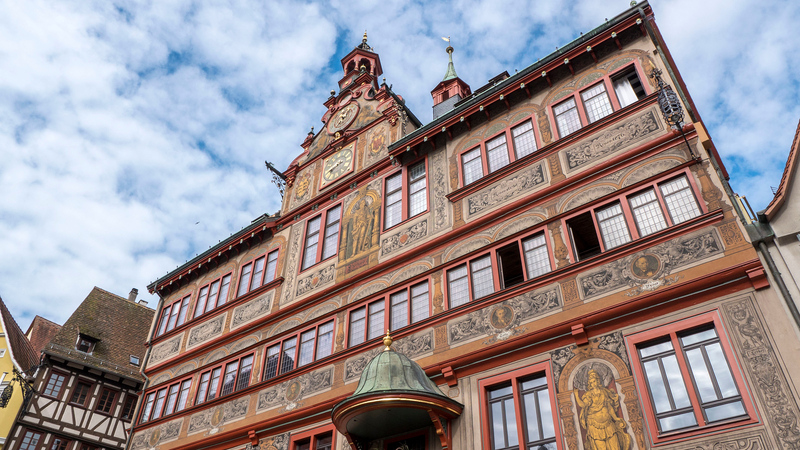 The Rathaus (City Hall) serves as the focal point, and it is an intricately painted building with a functioning astronomical clock at the top. The facade was painted in 1877 to commemorate the 400th anniversary of the university. Take a break here from walking or stop for a cup of coffee. Admire Neptune’s Fountain, created by Heinrich Schickhard in the 17th century. 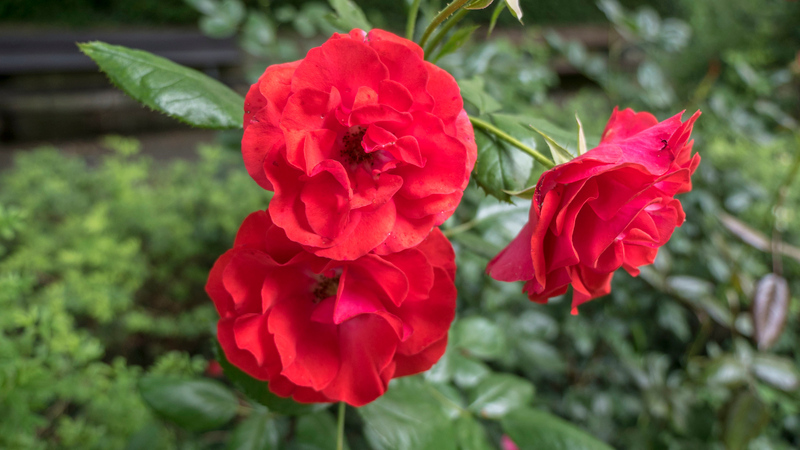 On Monday, Wednesday, and Friday mornings, be sure to check out the local farmer’s market for fresh produce and beautiful fresh flowers. We wandered through Market Square on numerous occasions and it was always bustling with people, whether it was students in the evening or patrons at the market in the morning. 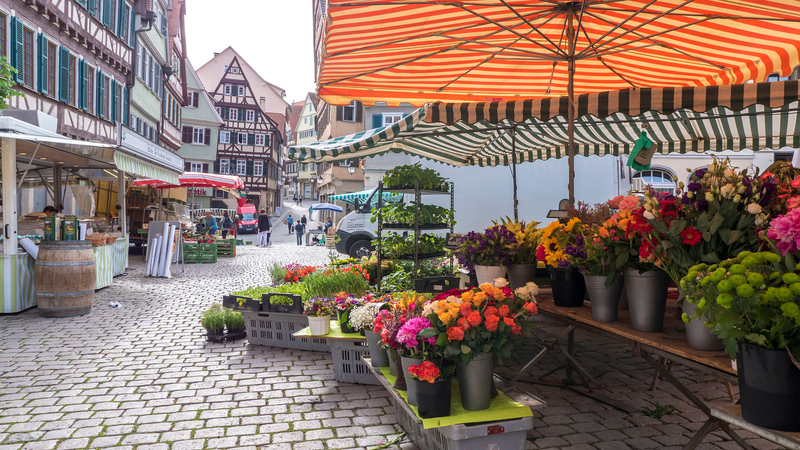 Browsing a market with the dramatic backdrop of city hall is certainly one of many unique things to do in Tubingen. The park, Neckarinsel, forms an island in the Neckar River in the middle of Tübingen. 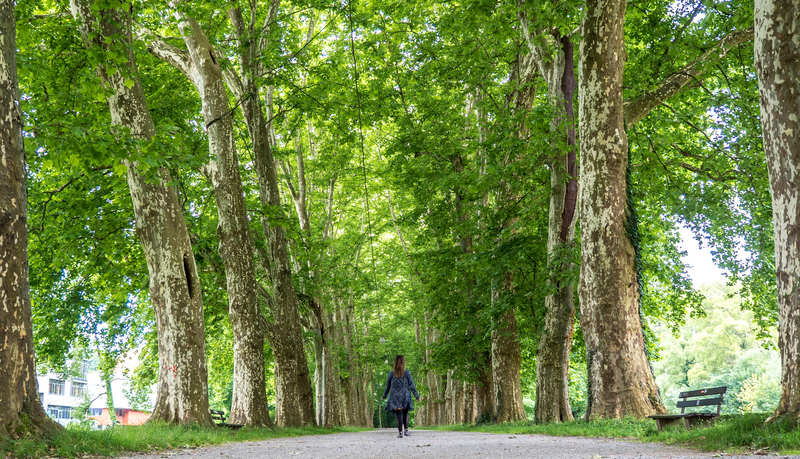 The Platanenallee is an avenue of 200 year old planar trees. Walk between the row of ancient trees that extend up to the sky. It’s one of the most scenic river walks along a distinct waterfront, bordered by colourful houses on the city wall. At the entrance to the Neckarinsel, there’s a large birdhouse for pigeons that was rather cute. 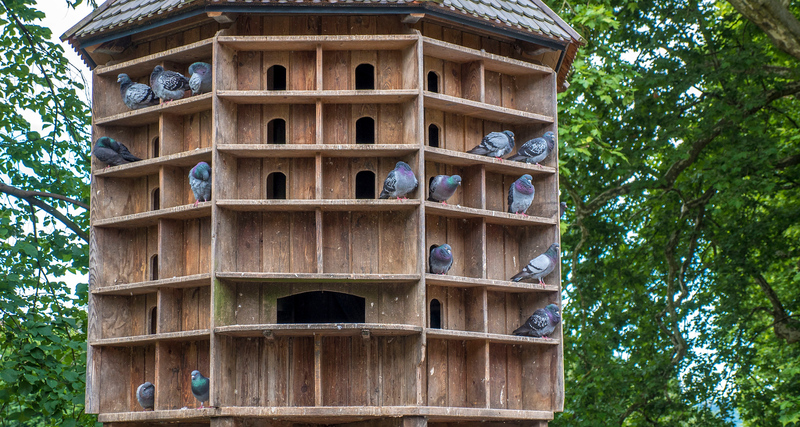 However, it’s more functional than just a home for pigeons. When the pigeons that live here lay their eggs, city workers replace their eggs with plaster ones in efforts to take control over the pigeon population. Another peaceful place in Tübingen is the botanical garden. 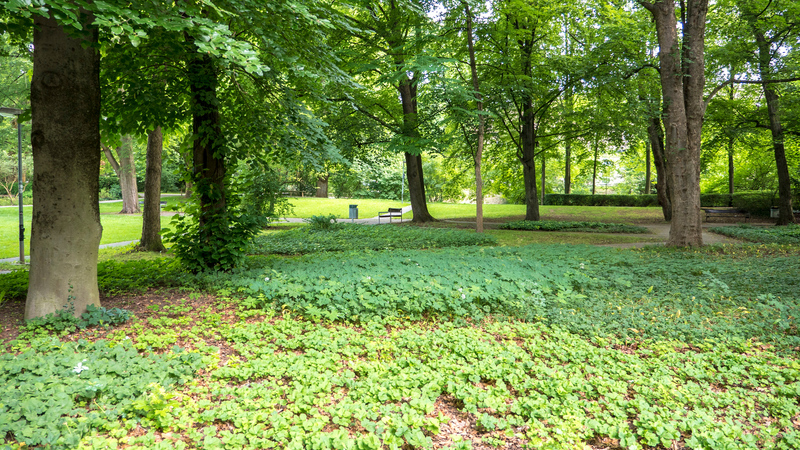 It’s a large, public park, where you can sit and admire the flora or simply meander about. Many people ride their bikes through here or relax on park benches. I found many flowerbeds and even a tree that was more than 250 years old. If I lived in Tubingen, I would love to spend more time here. I can see how it would be the perfect place to read a book as a university student. Spending peaceful moments in nature is one of my favourite things to do in Tubingen. 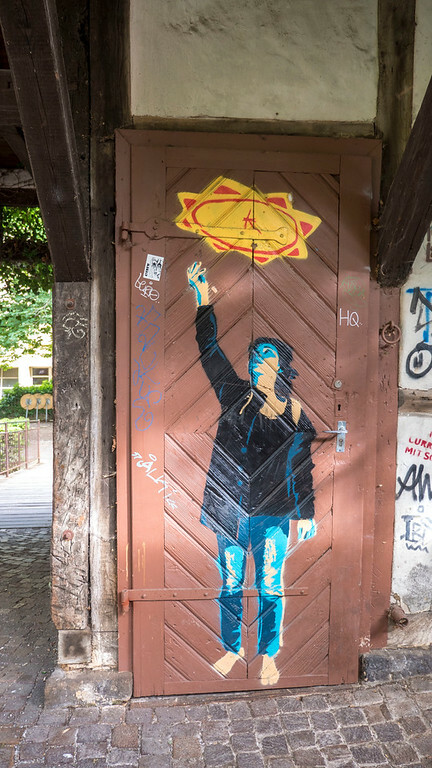 I wasn’t expecting to find any street art in Tübingen, but I should have known better. 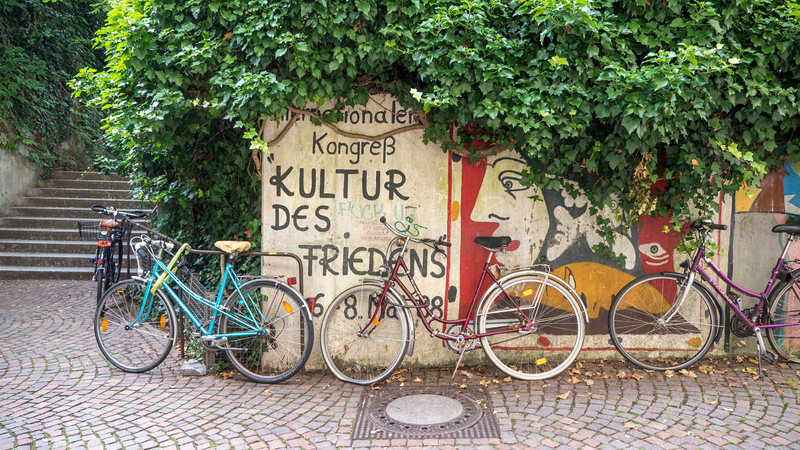 Tübingen is a youthful, mostly liberal town that focuses on artistic endeavors. There are some small statues and sculptures, dedicated to things like reading and cycling. 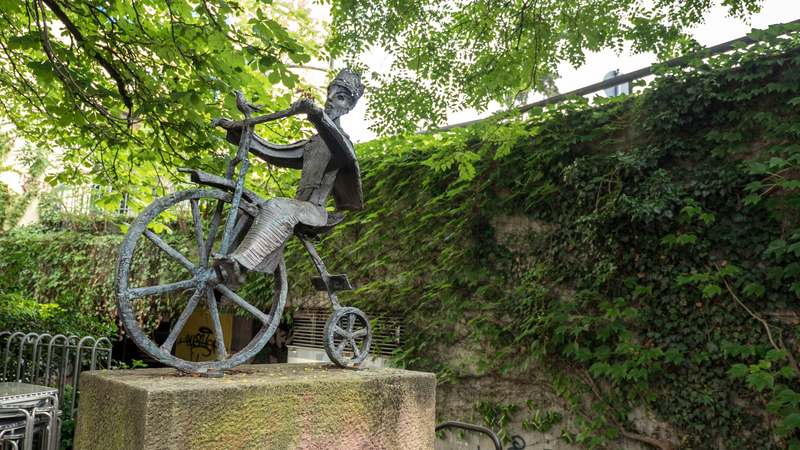 The Radfahrerkönig, also known as the Cycling King, is a small statue in a square that pays tribute to a favourite pasttime in Tubingen, which is bike riding. 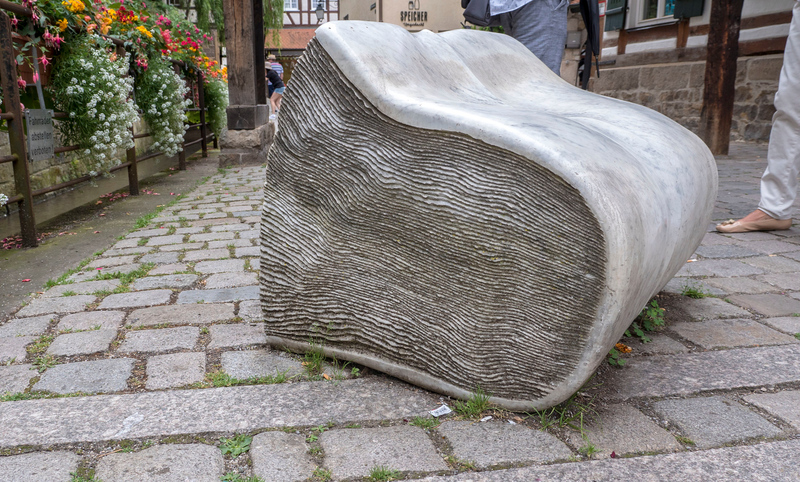 I also found another sculpture of a book, as well as some other art on walls and doors. There’s likely even more around town – you just need to wander around to discover it! While this isn’t a work of art, it is a beautiful structure that may as well be. 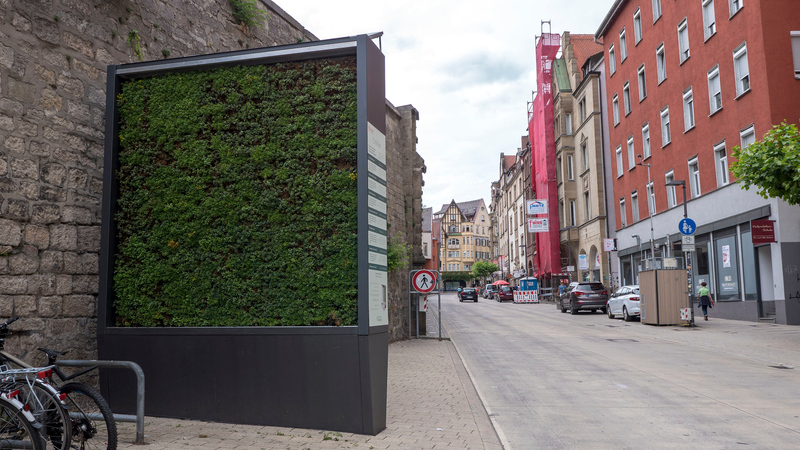 This is Tubingen’s CityTree, designed to improve air quality in an eco-friendly manner. This extra splash of greenery also adds an interesting and wonderful design element to an otherwise ordinary city street. 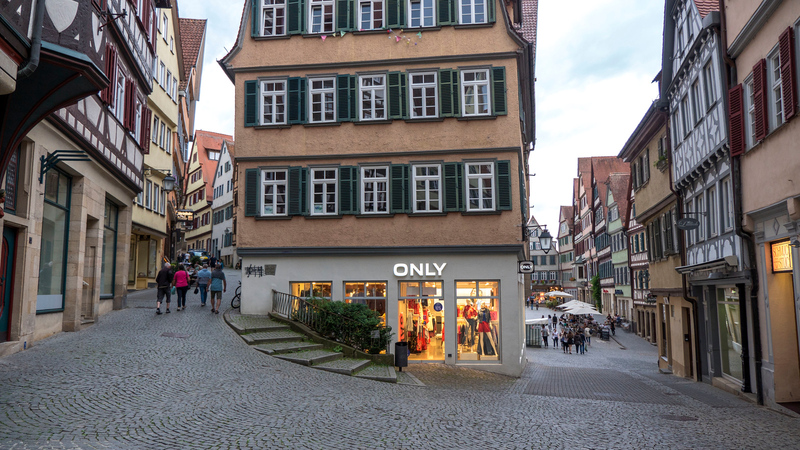 There are many specialty shops and boutiques to get a dose of retail therapy in Tübingen. 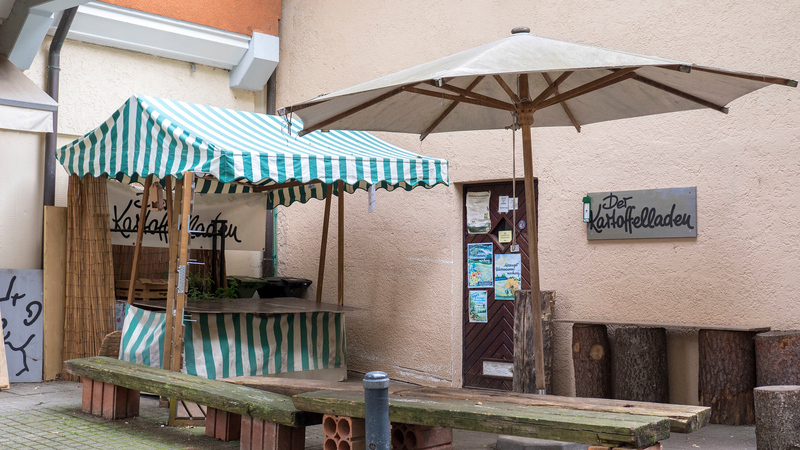 While it might not seem like one of the top things to do in Tubingen, there are many unique, independently owned shops in town. Der Kartoffelladen sells knives and potatoes, an interesting combination. At Speicher, you’ll find groceries and food from around the world, as well as a focus on bulk foods without any packaging. At Alnatura Super Natur Markt, there were lots of organic and specialty foods, including lots of vegan items like chocolate and ice cream bars. In addition, there are lots of quaint coffee shops and small clothing boutiques. I kept walking past this one shop window with a dress that caught my eye. Finally, I decided to go in to try it on, and ended up bringing it home with me! If you’re shopping for gifts for loved ones, I am sure you will find something special in Tubingen. 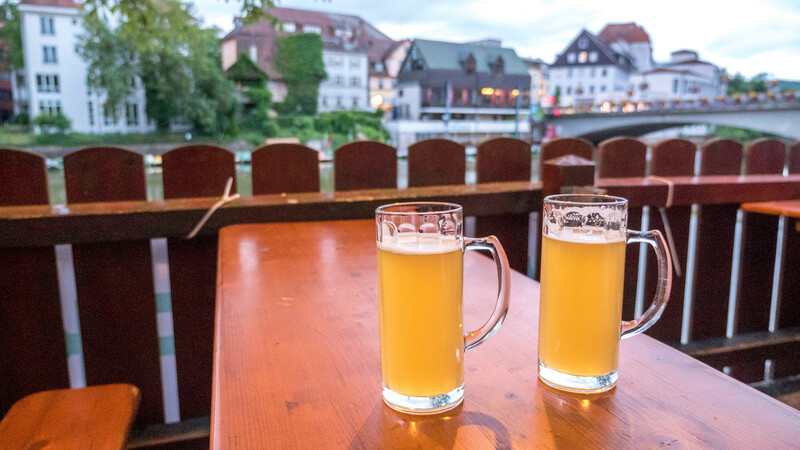 As for visiting Tubingen, you can’t travel here without stopping at a beer garden! Gasthausbrauerei Neckarmüller is a favourite local spot, right on the Neckar River. It’s definitely one of my top things to do in Tubingen. Try the locally brewed beer while you admire views of the river from picnic tables lining the waterfront. It’s a great place to mingle with the locals while drinking some refreshing pints! When we visited, the World Cup was happening and everyone was sitting in front of an outdoor TV screen to watch the game. 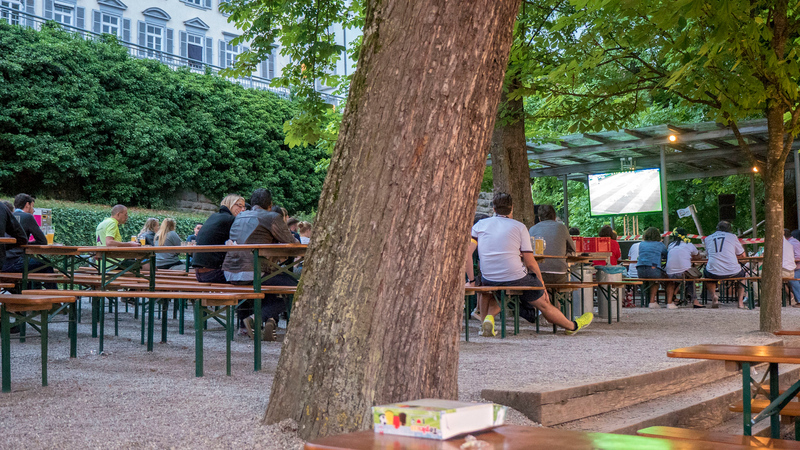 Unfortunately, Germany didn’t win the game when we were there, but it seemed as though everyone in town was crowded in front of a screen at a local beer garden, restaurant, or pub. Justin and I ate lots of delicious vegan food in Tubingen. There are lots of vegan and vegetarian offerings at restaurants, which isn’t too surprising given the younger student demographic. Here are a few notable spots to check out when you’re in town. 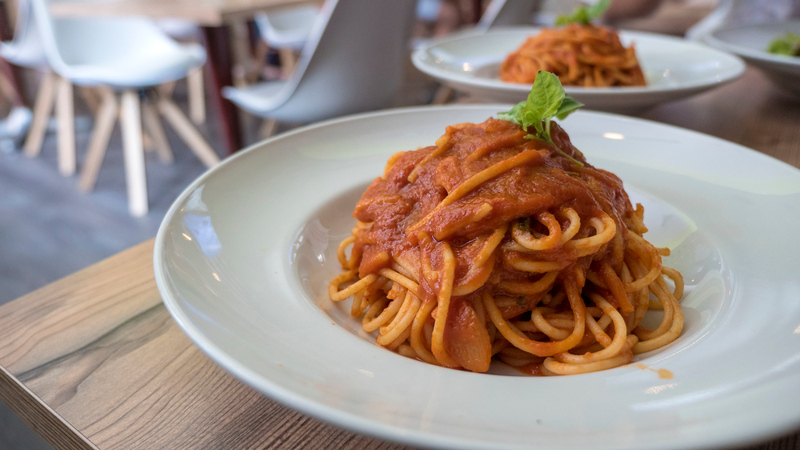 Fame Da Lupo is a small Italian joint serving up fresh pasta and pizza. Justin and I ordered the vegetarian dish on the menu, a fairly basic pasta with tomato sauce, as well as a side salad. The portions were pretty big and the food was tasty. It was prepared surprisingly quickly, making it a great option if you’re looking for lunch on the go. 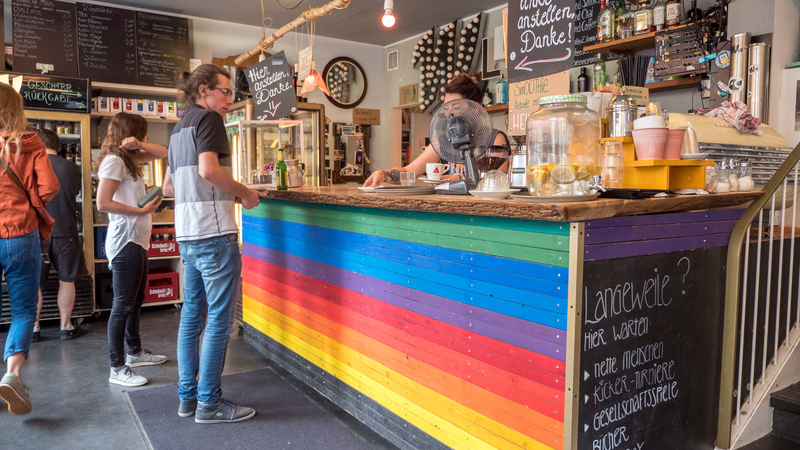 Willi is a cafe spanning two floors, as well as an outdoor patio. There are many vegan dessert options clearly marked in their cabinet. I ordered a coffee and a delicious slice of cake here that was heavenly. 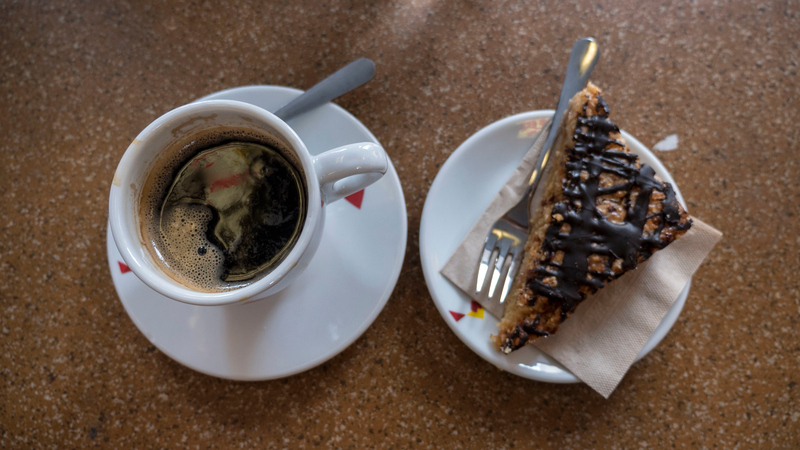 Hip vibes, vegan desserts, and flavourful coffee – what more could you ask for from a charming cafe? 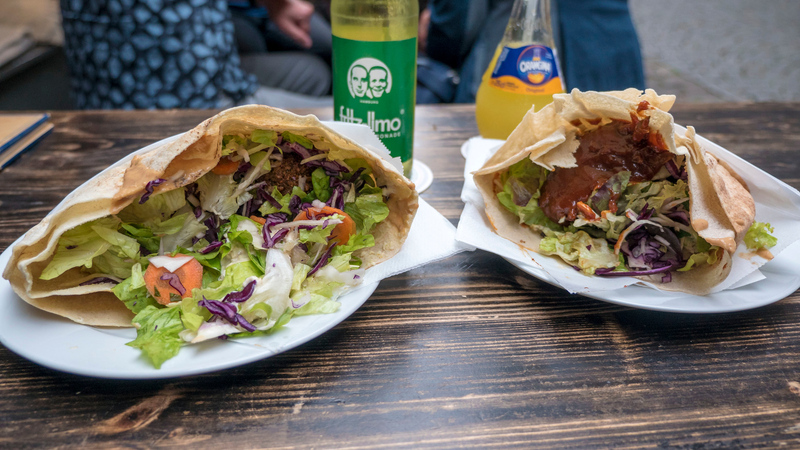 Vegi is a vegetarian and vegan restaurant, primarily serving up falafels and pitas. Justin and I both ordered falafels stuffed into pitas, and then proceeded to stuff our faces with them. They have a small patio outdoors, which was a great spot for people watching while enjoying our food. 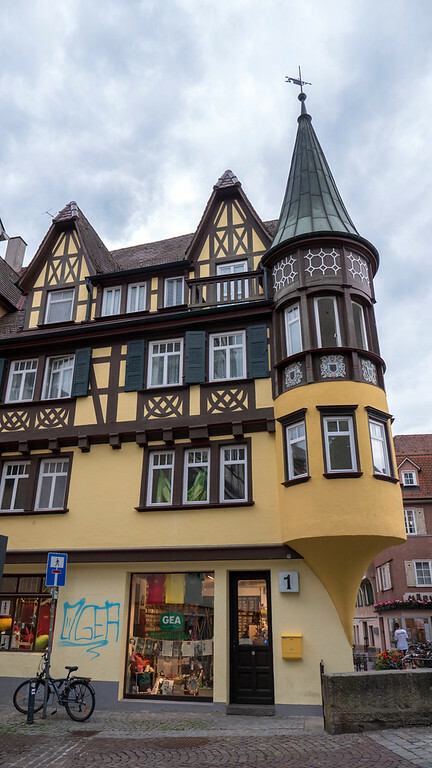 After enjoying all of the unique things to do in Tubingen, you’ll need somewhere comfortable to rest your head at night. 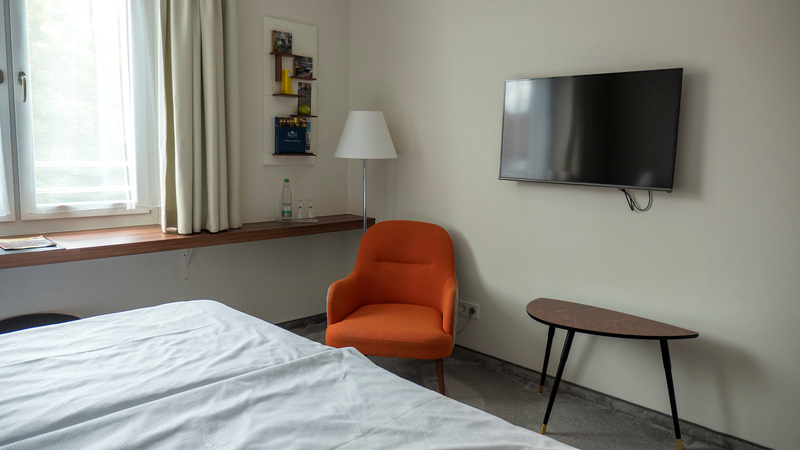 We spent the night at Hotel Krone, located just across the Neckar River in the perfect spot. We could walk everywhere from the hotel. Our room was bright and spacious. There was high speed Wi-Fi, a Tassimo coffee maker in the room, and a breakfast buffet was included in our stay. 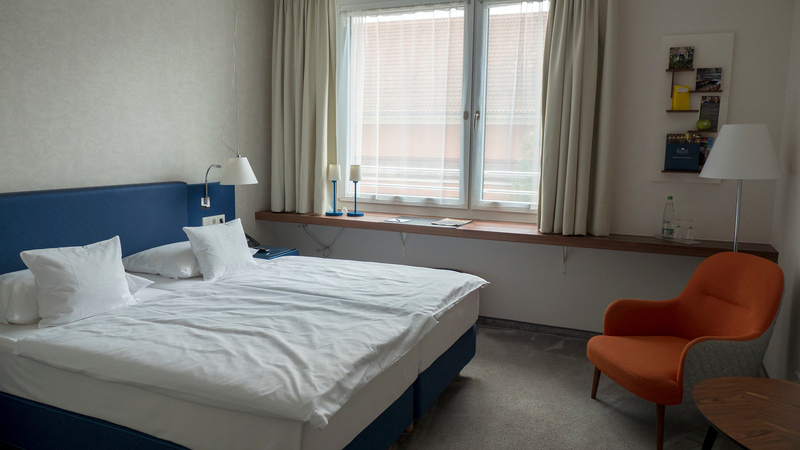 We highly recommend booking your stay at Hotel Krone. See what other guests of the hotel are saying in their reviews. 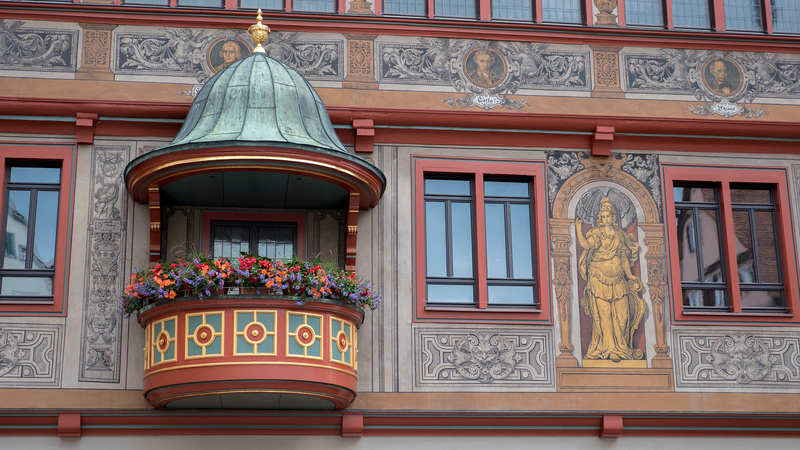 If you’d like to see more photos of Tubingen, please visit our entire travel photo gallery. You can even purchase prints, housewares, and many other items made from any of our photos from our travel photography site. 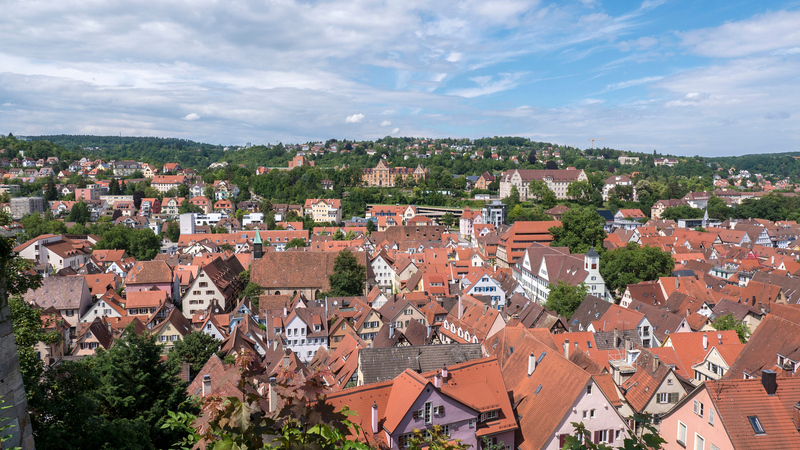 If you’ve got an extra day in Germany before heading back to Frankfurt, or you’re looking to spend some time in a quaint German town, head straight to Tübingen. I’m sure you’ll fall in love like we did. 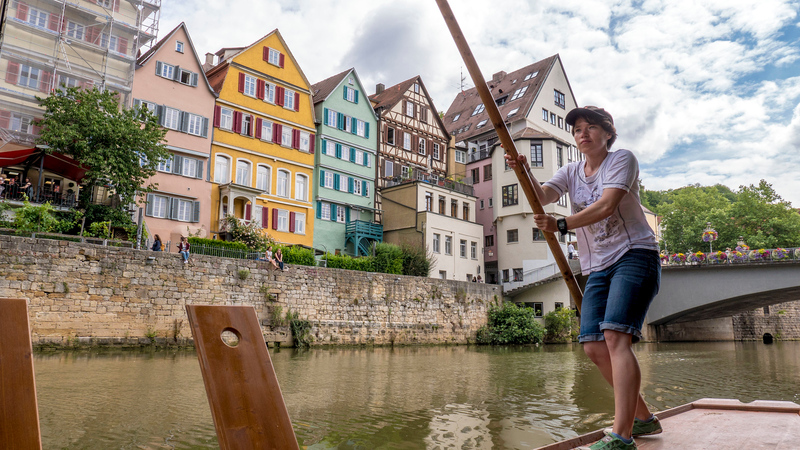 Between sampling local beer, walking an avenue of ancient trees, or trying your hand at punting, there’s no shortage of unique things to do in Tubingen. 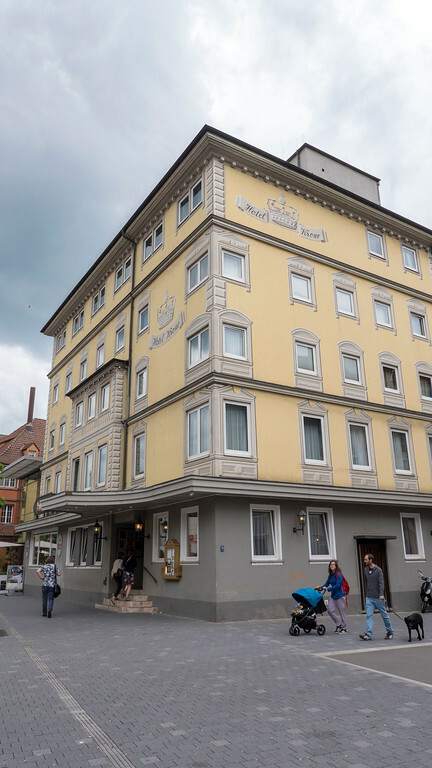 We’d love to return to spend more time here as we know we’ve only scraped the surface of what Tübingen has to offer. What’s your favourite town in Germany?